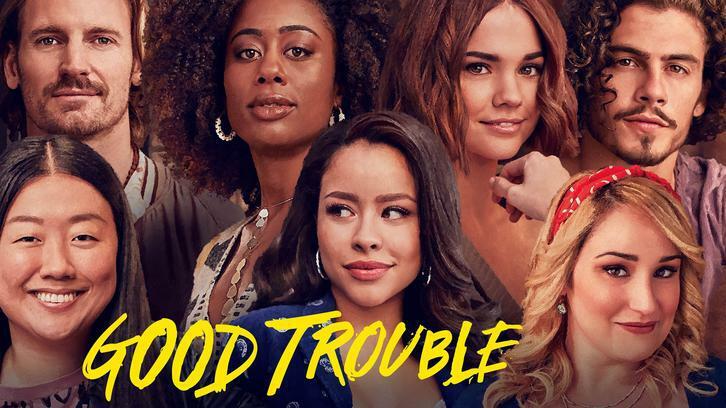 Good Trouble is not having a great time ratings-wise, and this has turned me into a sad panda every Wednesday afternoon. Despite the abysmal ratings which to be quite frank are okay-ish for Freeform, I still love this show, and I want more people to watch it. The storytelling is fascinating and the combination of Callie, Mariana and all the characters living in the coterie make it worth watching. So, let’s talk a little bit about “Playing the Game.” An episode that is superbly written acted and directed. The episode is filmed in media res with a couple of flashbacks. It begins with Callie and her two clerk frenemies having a drink discussing their very awkward afternoon “barbeque” picnic at Judge Wilsons home. I don’t know what the Judges deal is, but he seems to appreciate Callie’s input more than the others. We meet Judge Wilson’s creepy wife Libby (Jessica Tuck) and his mysterious son Tate (Zachary Gordon) who never leaves the house. The gathering is not what you would expect, and there’s a game that the Judge plays with his clerks that increases the strain within the group. Ben is still insufferable and is trying to snoop around Callie’s life. He might put two and two together soon and then things will get worse for Callie. Rebecca and Ben are obviously in cahoots, but I think they will chew each other out once they are done messing with Callie’s head. Mariana’s life appears to be stuck. She is partying all night as a way to numb her frustrations. I hope she doesn’t spin out of control. The men at Speculate continue to treat her like an idiot, although Raj seems to be warming up to her. Speculate has a “diversity and inclusion” event that goes as best as you can imagine. There is a scene between Mariana and Casey where they talk about women in engineering, and it is maddening to listen to especially in 2019. Mariana, Davia, and Brian hang out together, and there’s a big storyline for Davia in this episode. A lot is revealed about Davia that I was not ready for and when Mariana shares her concerns it is brushed off. Emma Hunton is terrific in all her scenes particularly one that I was shocked to see on Freeform in all honesty. Alice is going through a heartache obviously brought on by Sumi who is very manipulative. I am not okay with this particular storyline, but I hope that the writers will give Alice someone else to be joyful about. Alice is a softy and has a good heart which everyone takes advantage of, and it is disheartening. Malika shows up big time for Alice which was nice to see. Speaking of Malika, she is going to cause a lot of trouble for Callie with Judge Wilson. This episode will make you cry but the music makes up for all the sorrow you will feel for Davia and Alice.